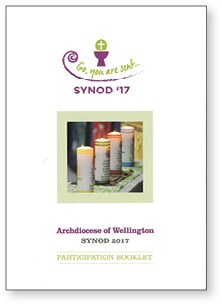 Everyone is invited to take part in the Synod 2017 participation process to contribute to the future direction of the Wellington Archdiocese for the next 10 years and beyond. Cardinal John would like to hear from you as part of this participation process. ‘I am always encouraged by the thought and time that so many of you give to your faith and to the local Church, and I know you have insights and ideas which will be valuable. Please put them forward,’ says Cardinal John. On May 7, consultation got underway. The Synod Participation Booklet was distributed to all parishes. …to support marriage and families (guidance Amoris Laetitia). All submissions are due by Friday 30 June. Booklets are also on the Archdiocesan website: tinyurl.com/Synod-17-Participation. Submissions are welcome from groups and individuals about any of the ten topics. The questions for each topic are in the booklet and are ‘starters’ to stimulate thought and reflection. When responding, people need not be limited by these questions. Your input will help determine what will be considered during the Synod weekend, 15‒17 September, this year. Cardinal John held Synod workshops at Richmond, Nelson, on Saturday 20 May and at Bishop Viard College, Porirua, on Saturday 27 May. He thanked everyone who attended these hui especially those who travelled long distances to participate. The booklet describes the discernment process, which begins with prayer – karakia. For groups, this involves listening to one another. Listening is a critical part of the discernment process. Following this, each person shares their thoughts without interruption or comment from the other participants. It is about listening to what God is saying to each one of us – that is, to being present to the Holy Spirit and to each other.